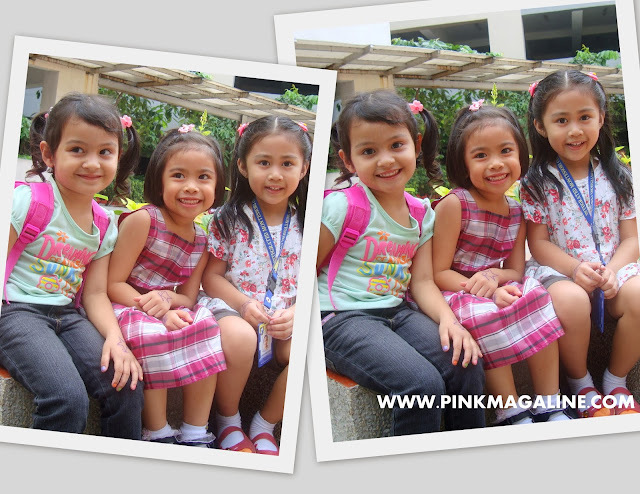 These photos of my elder daughter and a couple of her classmates were taken last year, her first year as a preschooler. I can't believe she is almost done with Junior Casa 2. She was just a baby when she started schooling at 3 years old. Now she's already 5 and taller, latest photos here. Whew, time has flown by so fast! I am so proud of my firstborn. She could only identify different shapes and colors, memorize the ABCs and count 1 to 10 when she first entered Junior Casa 1. Now she can read blended words, add and subtract 2 digit numbers, tell the states of matter, etcetera. Aside from her regular school, she's also attending a Kumon reading class, then Math class starting next week. My husband and I have big dreams for our elder daughter. As parents, we want her to grow up into a fine young lady, send her to the best school we can afford in order to help her get a bright future. To beat boredom on our usual stay-at-home weekend, our family decided to have a little trip to Pasig Rainforest, formerly known as Pasig Central Park. It's been over 5 years since the last time I visited this park in Barangay Maybunga, Pasig City. They added more features to the park like a butterfly garden, a pavilion, a mini train, an adventure center which includes a zipline, a flower garden, and animal statues. Pasig Rainforest Park is a public park so it's normally crowded specially on weekends. Posing in front of a dinosaur, my elder daughter was the most excited to go to this place. We lost our way to the tower of Alice but still enjoyed The Maze. She poses for a photo with this lonesome horse at the Petting Zoo. These black butterflies were caught snacking on some ripe pineapples at the Butterfly Garden. Just had to snap a photo of this yellow flower at the Flower Garden. 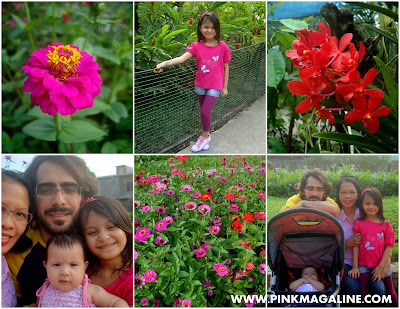 This is our family in a collage of more photos of flowers from the park. A park like Pasig's is a nice place to visit when you have limited budget and do not have time for a long trip. There is free parking on a first come, first served basis, entrance to the park is free, and the fee for each feature is minimal, only P10 for kids and P20 for adults. Other amenities like the youth center and the senior citizen area has no entrance fee. One can hire the pavilion for special occasions like birthday, reception, meeting, etc. Picnic huts are for rent inside the park, so you can bring your own food to be shared with your family. Snacks are available at food kiosk, too. My elder daughter enjoyed the zoo a lot. She complained about some smelly animals like chickens, pigs and rabbits but overall, I know she liked what she saw and experienced. Another thing that she liked was the Children's Playground. Problem is, there was too much dust in there. I hope they cover the ground with sand or use rubber mats. My favorite feature is the Flower Garden. It's very nice to take photos there. Hubby would have enjoyed the Adventure Park's zipline, but he had backache that day. Next time I guess. 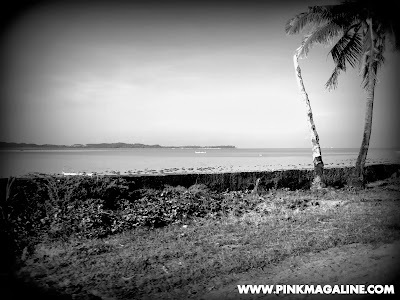 If I were a Maybunga resident, I think I would go to this park every morning to exercise and jog. If you live around Pasig, particularly in District II, it is a perfect park to go for fresh air or for some dog walking. Like they say, it is an oasis to the city's hustle and bustle. I wish there is a place like it here in Mandaluyong. Too bad the Tiger City doesn't have anything much to boast when it comes to parks. The only park I know which is enough for enjoyment is SM Megamall. Just kidding. 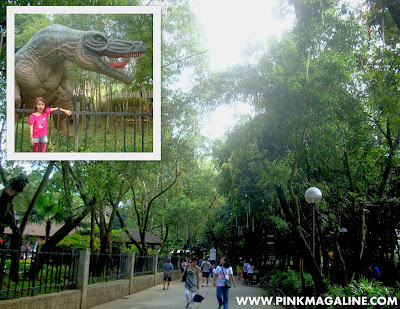 Have you ever been to Pasig Rainforest Park? Which feature did you like the most? Why? As requested, her is my entry on my Greek costume, a do-it-yourself project I made late last year. My elder daughter's classroom teacher required them to wear a goddess-inspired dress for their reading recital so I pushed myself to sew it, with love of course. Apparently, I had no choice because a ready to wear goddess costume wasn't easy to find. Majority of my daughter's classmates had their costume customized for them. Here is a photo of the materials I used. The end product of my DIY project and the inspiration. My daughter and her classmates in their dance number. I am satisfied with the outcome of this project. My daughter's costume was very close to its inspiration. 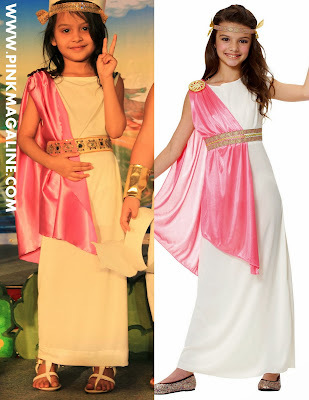 Paired with white and gold sandals and a headband, she looked so pretty just like a real Greek or Roman goddess wearing it. She sang and danced gracefully in her costume in the tune of a lively music featuring instruments like, if I'm not mistaken, B3 Guitars and Pulse drums. Sorry for the quality of the photos though. We came a bit late so we didn't have time to adjust the camera settings for the dark venue. What do you think about do-it-yourself projects like this? Have you tried making your own costume before? Did you save money by doing it? One Sunday morning, my elder daughter came to me asking about day off. Prior to that, she was in the kitchen talking to one of my cousins. Below was our conversation. 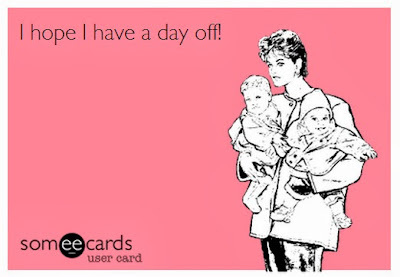 Askim: "Mama, what is day off?" Me: "A day off is a free day when someone is not working". Askim: "Tita Yelle said, ate Mylene is day off". Me: "Oh, she mean to say she is not working today." Askim: "Can I have day off, Mama?" Me: "You can't have a day off 'cause you're just a kid and you're not working". Askim: "Oh, how about you, Mama? Do you have a day off?" Me: "That's the problem! I wonder why I don't have a day off!!" And then I laughed out loud thinking it was so smart of her to ask those questions. Hubby who was at the dining area overheard the conversation so he laughed as well. Hahaha! Just a week ago, I received kawaii pink gifts from Lizzie, a Filipino blogger friend who is currently based in Indonesia. If you follow me in Instagram then I bet you saw me post this photo with the caption, "Something cute. Something fluffy. Something pink. Something pretty. Thanks to the fairy who sent these (to me)". 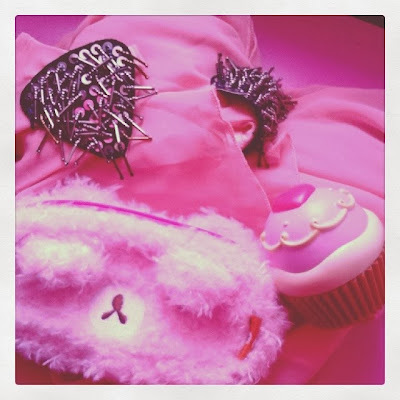 The parcel contained a bubble dress, a cupcake coin bank and a pouch all in pink color. I thought it was so sweet of her. I feel happy and blessed. Thank you very much again Lizzie dear. Now guess what, just a couple of days after, I got notification from the postal office again, something that I was not totally expecting. This time, the parcel is coming from Demcy, another blogger friend who is based in Texas in the US. She knows I like pink things a lot so I got pink underwear, lipstick and makeup brushes, food cutter, dapper snappers, and candies. Along with these gifts is a personalized photo greeting card. When my elder saw it, she was like, can we do this too mama (printing a photo card)? Actually, it sounds like a brilliant idea for the next holiday season. Busy busy busy! That's how it went for us right after the holidays. We did a lot of things lately that almost every night, when I'm done breastfeeding my baby daughter and tucking the elder daughter to bed, I'd chose to either sit down lazily in front of TV or scan IG and Facebook in my mobile phone until getting sleepy. In the first week of the month, Suna turned 5 months and it was also her schedule to see the pediatrician for immunization. In the second week, we needed to go to an ENT for elder daughter's ear checkup which led to cleaning/flashing, at the same time, I visited an ophthalmologist to consult my eye problem. In the end, I was advised to wear prescription glasses, so yeah, I look pretty much like 33 now. Hahaha. Our darling Suna Isobel at 5 months old. As usual, it was ate who blew the cake. The busy schedule continued as I dragged the kids to the Department of Foreign Affairs for our passport application and renewal. At the same day, I requested for an NSO copy of Suna's birth certificate and later sent to DFA again for authentication (red ribbon). Thanks goodness for the NSO Helpline and DFA Express Authentication Service. I didn't have to go to the office of Philippine Census in Quezon City, battle the traffic, queue the lines, etc. and go to DFA office in Pasay to personally apply for the red ribbon. Apparently, our passports will be released next week and as well as baby daughter's (Turkish) national ID as hubby managed to process it. To explain the rush, we are running after the snow, hoping to get cheaper ticket to Turkey and fly at least before the winter wonderland bids goodbye. I am never a big fan of the cold weather but I have to go with the flow. Hubby really wants to grant our elder daughter's wish to see snow this year since we failed to see it last year. You know I blame this madness as triggered by the Disney movie Frozen. The elder daughter is currently very much fascinated with the Elsa's magical power to create snow as she sings Let It Go. In the meantime, I will be busy again looking for a new school. Askim might be accelerated to grade one next year. Hubby and I do not push her a lot to it but we motivated her a bit. It will be very nice if she passes the test and skips kindergarten or advance casa, saving her a year from schooling and helping us save money. We already told her that she'll get a new bicycle as a reward if she earns a passing grade that will serve as her ticket to enter an elementary school. I googled and called a number of private schools in Mandaluyong and its neighboring cities and was able to gather information on schedule of classes, amount of tuition, number of students, etc. Just this afternoon, I received a copy of the list of requirements to an international school in Pasig. No final decision yet regarding our elder daughter's next school, though. Only one thing is for sure, that she will stop attending her present school and she's transferring to a bigger one. First blog entry for 2014. I have nothing much to blab about except that hubby initially wanted to take us to Baguio or Subic for the holidays but I didn't support the idea. I think long drive with an active preschooler and a newborn baby can be very uncomfortable. We ended up spending both Christmas and New Year at home. Besides, it is not where you celebrate the holidays, it is with whom you celebrate them with. We had this lovely gingerbread house as a centerpiece for Christmas. Hubby and I saw it at S & R and thought the girls would love it. True enough.. Suna couldn't take her eyes off this biscuit house, while surprisingly, Askim didn't mind it at all. She was too busy with her presents. She got the most number of gifts this year, more or less 20. After dinner that Christmas eve, I phoned auntie Jo who was spending Christmas with Papa Jose, my dearest grandpa, at our provincial house in Romblon. Subject of conversation was about family, yuletide and stuff. A little later before the clock hits twelve, she called back and informed me between sobs that Papa already passed away. Though we kind of expected it because of his old age, his health deteriorated after Mama passed away; I still felt really bad, slept the noche buena in tears. He was the best grandfather in the world. He took care of me and my siblings. Goodbye Papa. You must be happy now together with Mama, Nanay, auntie Rosalie, Uncle Ricardo (the first) and Uncle Ricardo (second). We love you so much. You are always in our heart! Moving on, I cooked a 4 course meal for our New Year's Eve dinner. I didn't cook too much like I did for Christmas dinner to avoid leftover. Besides, there are only 4 adults in the house including a couple of helpers, then the kids. After dinner and a little rest, we tucked the kids to bed and then watched Turkish TV until midnight. The following are some shots from our year-end photo session. This year's color is red-white-black. I didn't upload a photo which includes hubby, but I'm sure you know what color he wore if you follow me on Instagram. New year, new hair. Hubby finally allowed me to chop it off because of falling hair. Arrghh.. post-pregnancy problems you know. Anyway, I wore the houndstooth overlap dress that I bought from Zalora for the photo op, while the girls both wore a polka dot dress. Suna was looking adorable in her outfit with matching bow headband. She was squirming in some parts of the session, so I had someone tease her as to get a good shot. Glad that her ate looked at the camera and managed to flash cute smiles. Will print and frame some of our year-end photos and have them displayed on our walls. This year, I have some goals for this blog as well as resolutions for my own life. Part of my goal is to save all my blogging money then invest it into something valuable by the end of the year. Another goal is to publish longer and more sensible posts. Other goals include editing the layout and organizing the entries. It's going to be a long process and it starts today.